A subjective definition of noise could be ‘unwanted sound’. What is noise to one person is just entertainment to another. Ask two persons of different ages what they think about Rap music, for instance. From a scientific perspective, noise is a series of pressure waves. From a legal standpoint the definition of noise is different: the best practice exposure level is 85 db for all workers averaged over an eight hour period. The decibel scale is a logarithmic scale, which means that the scale is not linear, and we really have a hard time relating to the numbers. For example, an increase in the noise level of 10 db means a tenfold increase in the actual noise level. Noise erodes the small hair cells inside the cochlea of the human hearing organ. It is normally a very gradual process, and not a very noticeable one in the early stages. The damage that occurs on a daily basis is at first only temporary hearing loss. With repeated noise exposure the temporary damage turns into a permanent damage. At this stage the damage is irreversible. How can you prevent this from happening to you or your employees? Noise control measures should come first. Get rid of the noise whenever possible. When all measures have been taken to improve the environment, so far as is reasonably practicable, then we should consider hearing protection. An average ear muff or ear plug will reduce noise on average by about 20 to 29 db. Considering that every 3 db cuts the noise in half, you can get a lot of protection from an ear muff or ear plug. But hearing protection has to be used correctly or it will lose a great proportion of its effectiveness. The louder the noise, the more damage it can cause, and much of it? could be long term damage. We need to address what measures are to be taken to reduce the risk of exposure, in turn preventing long term damage to the employees. By contrast, some damage can be caused immediately, when people are exposed to peak sound waves produced by loud noises such as explosions or cartridge-operated tools. Anyone can be exposed to excessive noise levels. However, those working in noisy workplaces, factories, foundries, working with power tools, plant and machinery, and in noisy environments such as construction sites are among those most at risk. It is the obligation of the employer to ensure that every effort has been made to protect staff at risk of noise in the workplace. General Health and Safety legislation covers all employers and workplaces - specifically, the Control of Noise at Work Regulations 2005 in the UK, which are a good source of guidelines in the absence of local law. These regulations require employers to take action if daily or weekly exposure to noise is at, or in excess of certain Exposure Action Levels. The Exposure Action Levels are referenced in the Regulations in decibels (db). There is a general rule (the ‘two metre rule’) which can be used to simplify this and to put it into context. For example, the noise level is about 85db (A) if people have to raise their voices to be heard at a distance of about two metres from the source of the noise. Once a noise assessment has been completed this should not just be filed away. The noise assessment is just the start of the process, not the end. They should be used to assist the employer to carry out their duties to reduce the risk of hearing loss and control noise exposure. Employers must first try to eliminate or reduce noise in the workplace by means other than hearing protection. PPE should only be considered as a last resort and even then selected carefully. All hearing protection is relatively poor at low frequency noise reduction, but certain models which are specifically designed for this type of noise are far better than non-specialised hearing protection. As with all control strategies, we should consider making the? workplace safe before we start to look at handing pieces of safety equipment on to the workforce, the so-called safe place strategy being preferable to the safe person strategy. In all workplaces, it may be worth considering the design and layout of the premises. Perhaps there could be a designated area, away from the noise, in which the affected staff could take their breaks, ensuring that they have a complete rest from the exposure. The length of time that employees are exposed to such levels of noise is just as important as the volume itself. It is worth encouraging staff to take regular breaks and to spend time in designated quiet areas. Quite often, noise control requires more than one solution, as noise will be produced from a number of sources. Hearing protection should only be considered as a temporary measure, or as a last resort where a risk remains after steps have been taken to reduce noise levels. PPE should not be seen as a quick fix for a serious risk. It is not an alternative to controlling noise by technical and organisational means, but for tackling the immediate risk while other control measures are being developed. In the longer term, it should be used in tandem with technical and organisational changes and can even provide additional protection beyond what has been achieved through noise control. Protective equipment should be made available to employees where they are exposed to levels of noise. Ensuring that the right type of hearing protection is used is vital in the process. There are two main types - those which cover the ear and those which are inserted into the ear. The Noise Assessment should indicate which sort of equipment is the most suitable for the circumstances. The reduction of noise when using these different types of equipment varies. As a rough guide, in-ear plugs can reduce the noise level by 10-15 db (A) and ear muffs which cover the ear can reduce noise levels by 20-25 db (A), provided that they are fitted correctly. Of course, account must be taken of the frequency as well as the ‘loudness’ when considering which protective equipment is the most appropriate solution. This is an important factor, as not all types of equipment are suitable or offer the correct level of protection for every type of noise. For full guidance and advice, a specialist PPE supplier must be consulted. 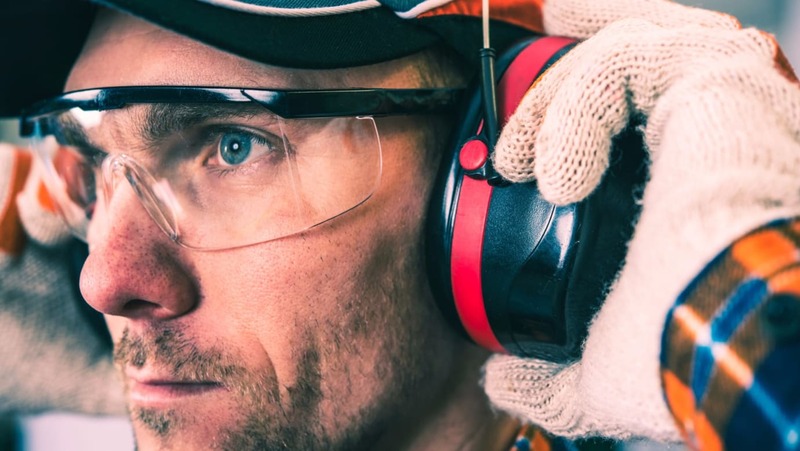 When supplying hearing protection, it is the responsibility of the employer to ensure that the equipment is compatible with other types of equipment already in use by the employee. Regular checks to ensure that the equipment is being used correctly, and that the equipment is in good working condition should also be a priority of the employer. Ear muffs and banded ear plugs are especially recommended in cases where the hearing protection must be taken off frequently due to repeated short term noise exposure, in cases where the user has narrow ear canals and in cases of inflammation of the ear canal. Ear plugs are recommended at workplaces with continuous noise, in case of extreme sweating under ear muffs, in case of simultaneous wearing of spectacles, goggles or if other personal protective equipment is worn. Ear plugs can be reusable or disposable. The reusable type must be kept scrupulously clean to avoid ear infections. Banded ear plugs are suitable in changing and less high noise situations, where they must be worn and taken off frequently. They shouldn’t be worn if sound pressure peaks can occur due to contact of the band - at a welder’s screen, for example. "hearing checks should be conducted by a competent person where employees are regularly exposed to noise levels above the action values"
Custom moulded ear plugs are individually fitted, offer a high level of wearer’s comfort and a high level of safety if the function (fitting) is checked when the plugs are delivered, and after that at regular intervals. They are often used if the worker has the beginnings of hearing damage, to ensure a reliable sound attenuation. Ear muffs and ear plugs with electro-acoustical equipment (level dependent hearing protection) are good to use in intermittent noise situations in the workplace if a good speech perception is required. Communication ear muffs or ear plugs can promote or allow communication in noisy areas. Ear-muffs with integrated entertainment facilities like FM radio are suitable particularly for workplaces with monotonous tasks in noisy areas. A check for the intelligibility of warning signals at the work place is necessary in each case. Once the employer has taken their responsibility for assessing and providing appropriate equipment, the employee also needs to comply. For example, employees must take all reasonable steps to ensure that any protective equipment used is returned to the accommodation provided for it after use. This applies unless the employee removes the equipment from the workplace. Examples of this type of equipment could include footwear or clothing. The employee should also examine any safety equipment before use to spot any loss or obvious defect, which of course must be immediately reported to their supervisor. Importantly, the employee should not be carrying out any sort of maintenance of the equipment, unless trained and authorised to do so. Employees should not intentionally vandalise the equipment provided - this is a particular problem associated with the use of ear muffs in hot weather, such as the summer months in the Gulf, which can result in workers drilling ventilation holes in the muffs. Office workers are encouraged to have eyesight checks if they are using display screen equipment regularly and are deemed to be at significant risk. Similar guidelines can transfer to workplaces affected by noise. Rather than eyesight checks, hearing checks. These should be carried out if there is a risk that noise levels could damage hearing. This will warn of any employees who may be suffering from early symptoms of hearing loss. It also allows employers to check that noise controls are adequate and update the levels of protection accordingly. Best practice states that health surveillance be implemented for all workers at or above the Upper Exposure Action Value. In order to establish a start point or datum, it is good practice to carry out hearing checks for new employees in noisy workplaces. Such datum can be used to monitor any possible future loss or hearing ability. Good noise management all comes down to training, which is the most vitally important component in health and safety. This should include ongoing training to existing staff and introductory training for new starters. A designated member of each team should be responsible for communicating to the rest, perhaps via regular tool box talks. Reviewing how the changes have affected staff needs to be regularly completed. This will be an indication of how well the noise controls put into place are working. Spot checks of equipment in usage and checks of the noise levels will demonstrate how effective these implementations have been and demonstrate management commitment. In summary, noise can be harmful, either causing short term or acute damage from excessively high levels of exposure to impact noise, or more commonly by progressive harm caused by regular exposure to much lower noise levels. When specifying personal protective equipment as the solution to a noise problem, always consult the specialist suppliers to ensure the best solution in terms of both loudness, db and frequency, HZ.